Check valves permit flow in one direction only and close automatically if flow reverse. Entirely automatic in action, depending upon pressure and velocity of flow within the line to perform their functions of opening and closing. Check valves permit flow in one direction only and close automatically if flow reverses, depending upon pressure and velocity of flow to perform the functions of the opening and closing. Cepex designs and manufactures an extensive family of check valves that can be used for a wide range of applications. These valves provide an exact and reliable control of fluids, and have been designed to offer maximum modularity and flexibility. Check valves permit flow in one direction only and close automatically if flow reverses. Lift check valve to DIN/EN with wafer-type body, centring aided by the body shape, shut-off by spring-loaded plate or valve disc guided by three stainless steel guiding pins. 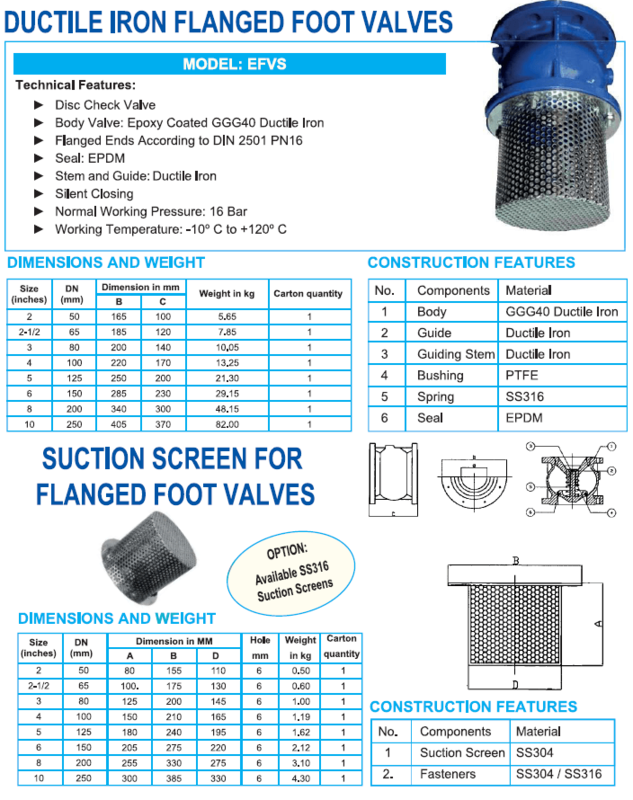 Foot valves work by ensuring that the water in a well pump only flows in one direction. Foot valves are a type of check valve, but they differ in that the flow area is larger in size than the rest of the pipe. This limits the amount of head loss in the pumping system. • 100% factory tested.• Easy installation and maintenance.• May be used either vertically and horizontally.• Available in PVC-U and Corzan® PVC-C.• Resistance to many inorganic chemicals.